Sometimes in life, you just have to treat yourself. It doesn’t have to be expensive, it doesn’t have to be flashy or designer, it just has to be unnecessary and make you feel good. Feeling good was definitely on the cards when I picked up this little lot. Did I need another snood? No. But did I want one? Yes. And in the colours mint and coral, could I really say no? These two are super soft with bundles of material. They’re pastel shades but they’re bright pastels and both mint and coral are wardrobe staples of mine during the spring. I even crack out the pastels during the winter and wear them with grey and black. 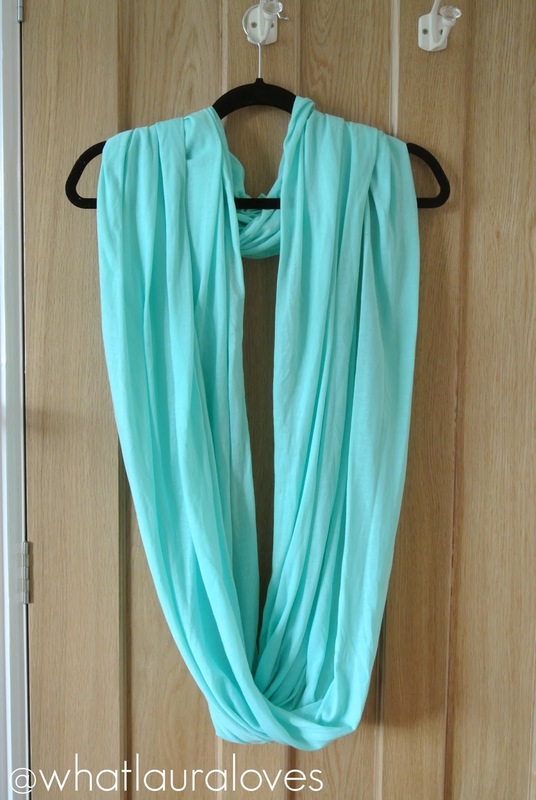 In short, mint and coral are my favourite colours and I love these snoods! I’ll be wearing them all spring with vest tops, cardi’s and either denim leggings or peg leg trousers. They can be worn either doubled up like I’ve shown in the coral snood photo or it can be worn long like in the photo of the mint snood. These are both available for £3 each in Primark. 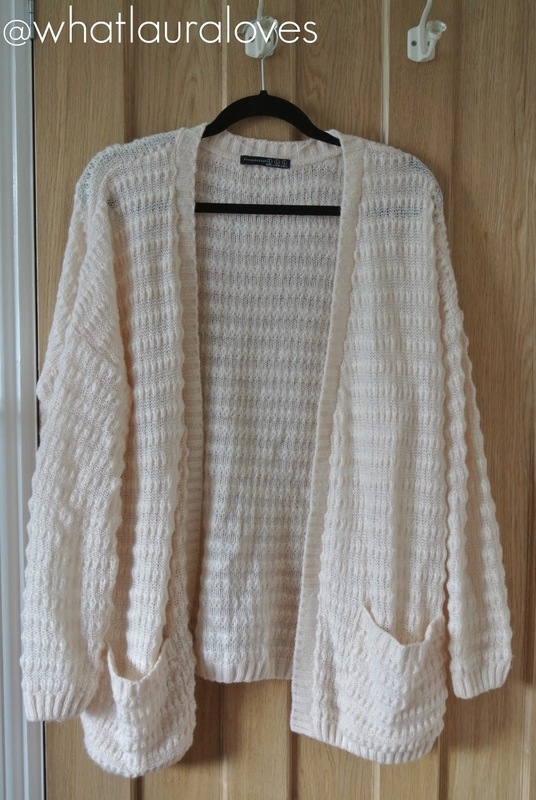 I also picked up an open cardigan which shows on the receipt as ‘Laguna Fluffy’ which hardly describes the garment but anyway, it is in the colour ‘Blush’ which is like a very light pink and it was £12. This is a super soft cardigan that doesn’t have buttons, so it is worn open. 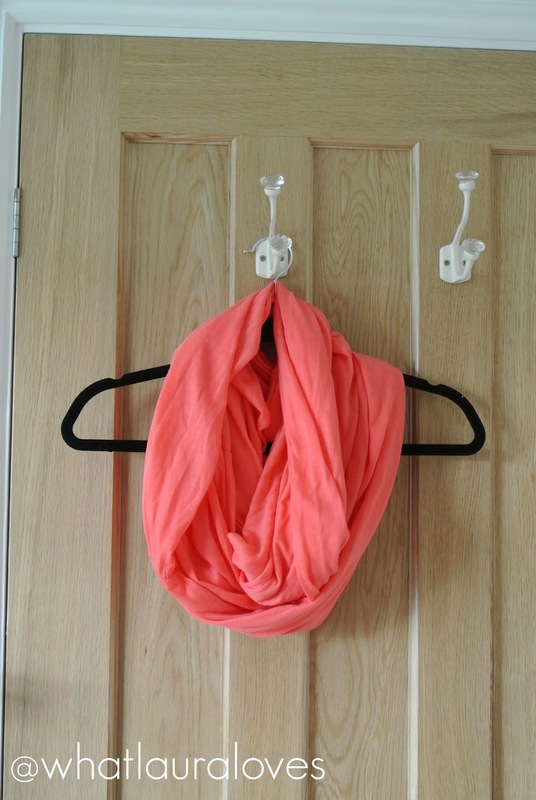 It has a pocket at the bottom on either side of the front of the cardigan. I absolutely love how warm and snuggly it is, yet light weight. I think the material will click really easily though so I will need to be careful not to catch it on anything. The sizing of this cardigan is very generous so I would suggest sizing down depending on how you like the fit. 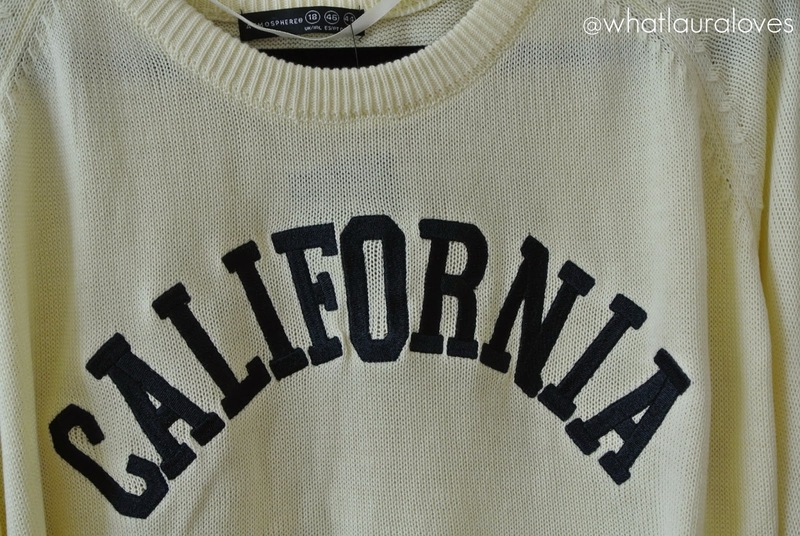 I’d seen the souvenir style jumpers on so many blogs and searched high and low for them in my local Primark. Thankfully I found them; there was only a few left and as luck would have it, they had my size! 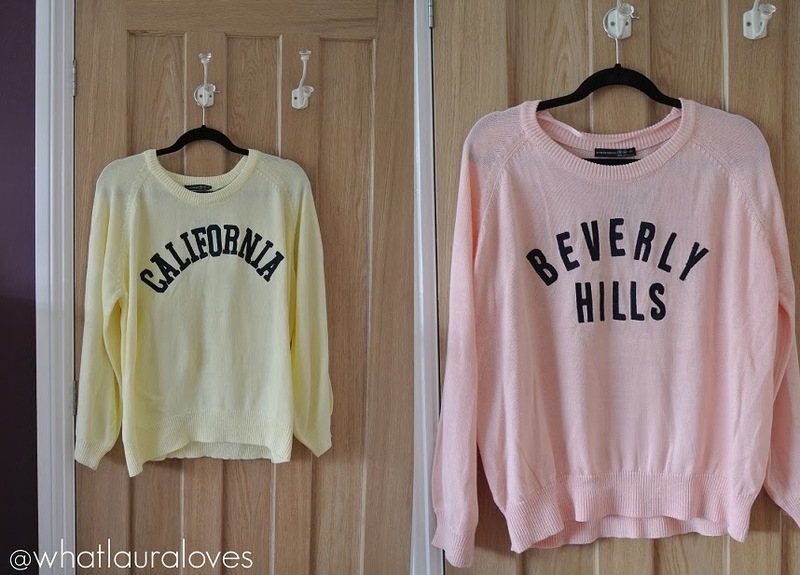 I bought the light yellow with ‘California’ across the front and the pastel pink with ‘Beverly Hills’ written on it in navy. They were £12 each and I can’t wait to wear them. 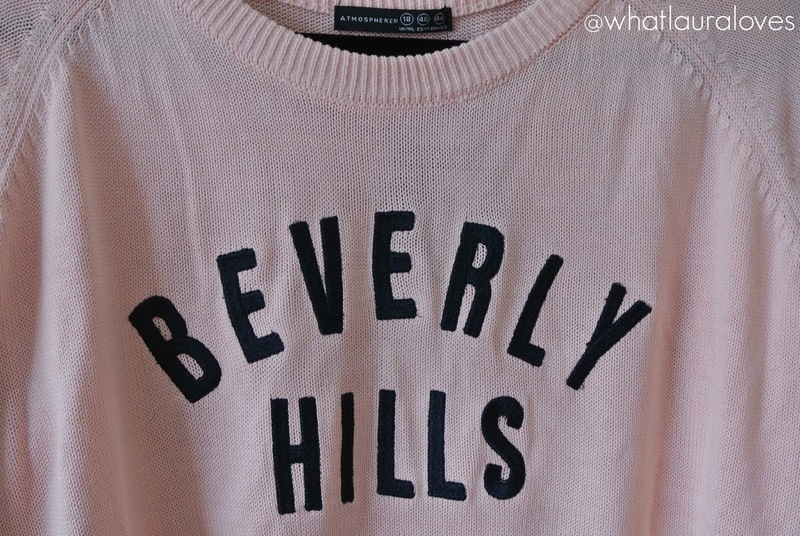 They’re very preppy which I love and the colours are perfect for the pastel trend this spring. I also picked up a couple of pairs of footies from Primark. These are the Seamless Footies with the Cushioned Sole which are £2.00 for a pack of two. They are just like normal footies, except they have a cushioned part where the balls of your feet would be and at the heel which is great if you’re wearing very flat shoes all day that have a thin sole as they can really kill after a long day! I’ve been buying these for well over a year now and I would really recommend them. They’re also great at stopping your feet from rubbing inside ballet flats. The last things I got from Primark were two pairs of their very basic, budget slipper loafer style shoes; one in mink and one in ‘blush’ which is clearly coral. Primark shade names really baffle me as these pumps are labelled as blush, as are the slightly pink toned cardigan above, yet they are both completely different colours. Go figure. Anyway, these were £4.00 each and are not a very well made shoe so I know they wont last very long but they’re really comfortable and the material inside is like a canvas rather than a shiny plastic which makes my feet sweat and rub. I can see me getting lots of wear out of these this spring. 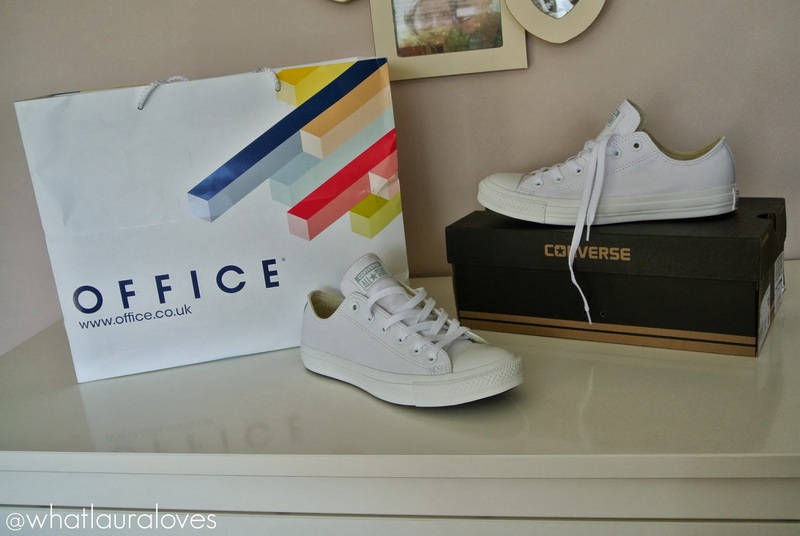 Another shop I went to was Office where I bought the Converse Allstar Low Leather White Mono Trainers which were £54.99. I actually bought these to customise for my wedding day so do let me know if you’d like a post on how I customise them. I really like them because they’re literally all white- they don’t even have the coloured lines around the base. They’re all leather too which makes a nice change from the canvas ones. I also placed a cheeky ASOS order for myself along with lots of things for Mr WLL for our honeymoon. 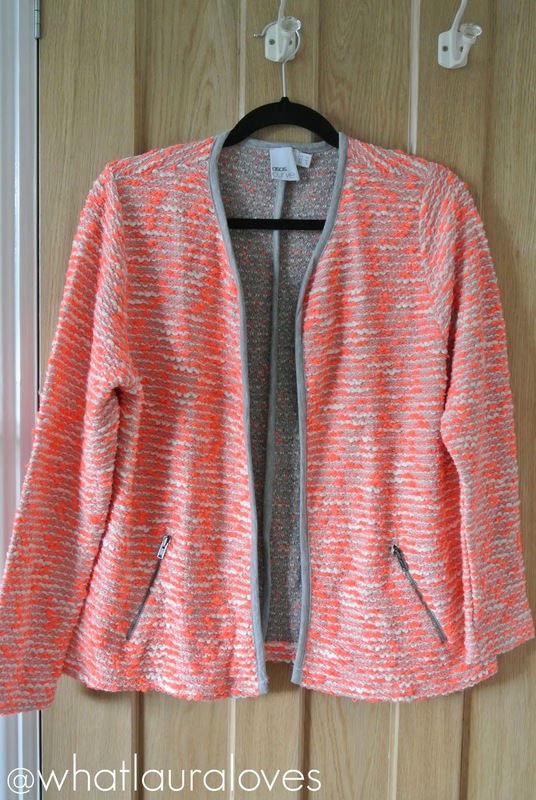 I ordered the ASOS Curve Blazer in Fluro Boucle which is so gorgeous, I absolutely love it. The fluro seems a lot more orange and brighter in person than it does online, making it a gorgeous piece to take me right through to summer. It is finished with grey jersey edging, has long sleeves and it has a zip pocket at the front on either side. The jacket is relatively light weight and is worn open so it looks great with a plain white vest underneath. I really love this jacket, it is very much a statement piece and unlike anything else in my wardrobe. It is also available from the standard ASOS line and in more colours too. 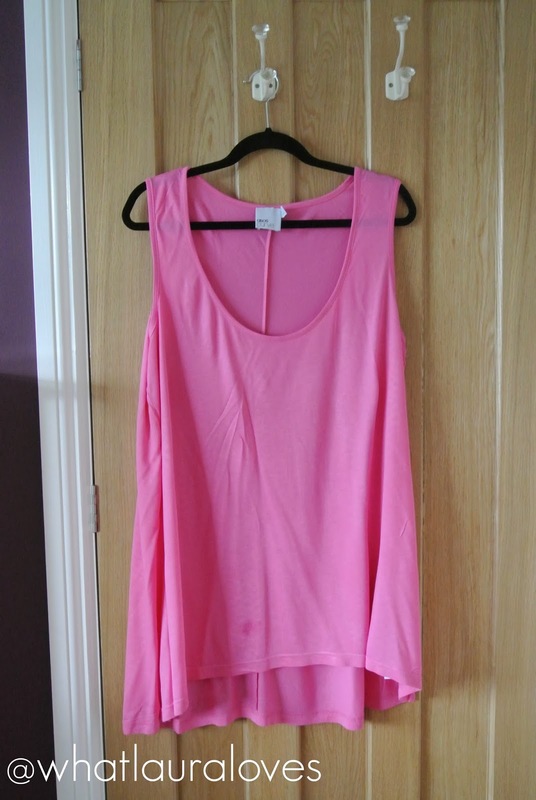 As well as the jacket, I bought the ASOS Curve Exclusive Swing Vest in Bright Pink. I already have this in black and it is such a well fitting, comfortable vest to wear, I absolutely love it. It is long enough to cover my bottom too. The colour is bright but not too bright so it isn’t too in your face. I am going to get a lot of wear out of this vest, from wearing it with shorts on holiday to pairing it with skater skirts for pretty days out and over leggings for the gym. As well as the bright pink and black, it is also available in navy. 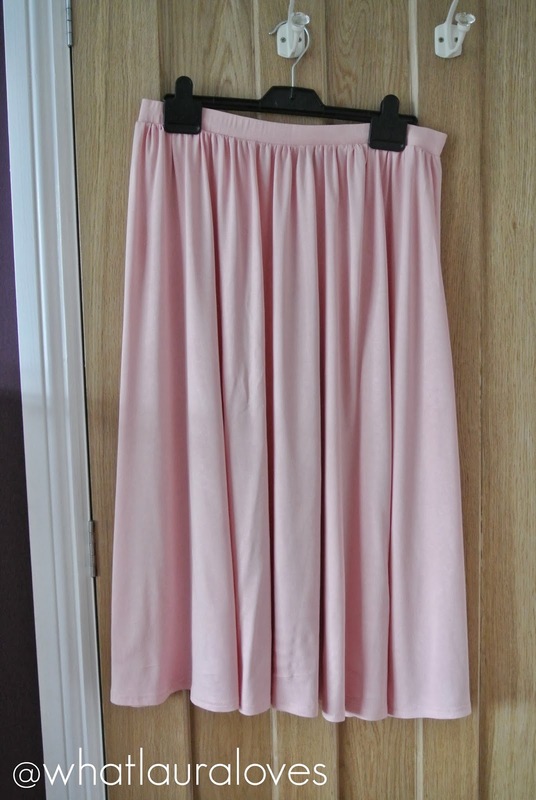 The last thing I bought from ASOS was from their standard line, I ordered the ASOS Full Midi Skirt in Pink. This skirt is a large fit so I would recommend sizing down. It is high waisted with an elasticated waist. The skirt is so soft and really flattering with its gentle pleating and floaty style. I can’t wait to wear it with sandals this spring! The last two items I bought were purchased from a small boutique shop in Sunderland called Truly Gifted. The necklace and the earrings both came in box with Malissa J Collection written on it so whether they’re by that designer I’m not sure but they’re gorgeous all the same. 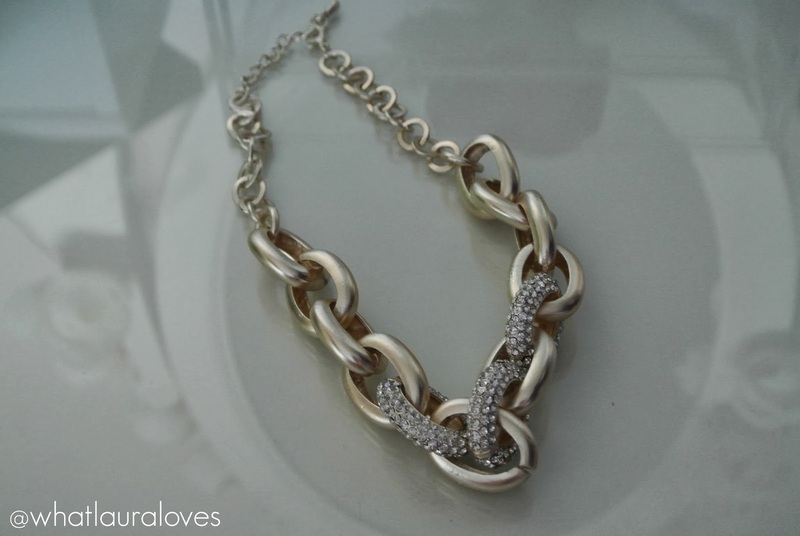 The necklace is a solid pave chain in a brushed light gold with diamantes and is very reminiscent of the J Crew bracelet that Nikki Phillippi wears in some of her YouTube videos. I think it was about £28. 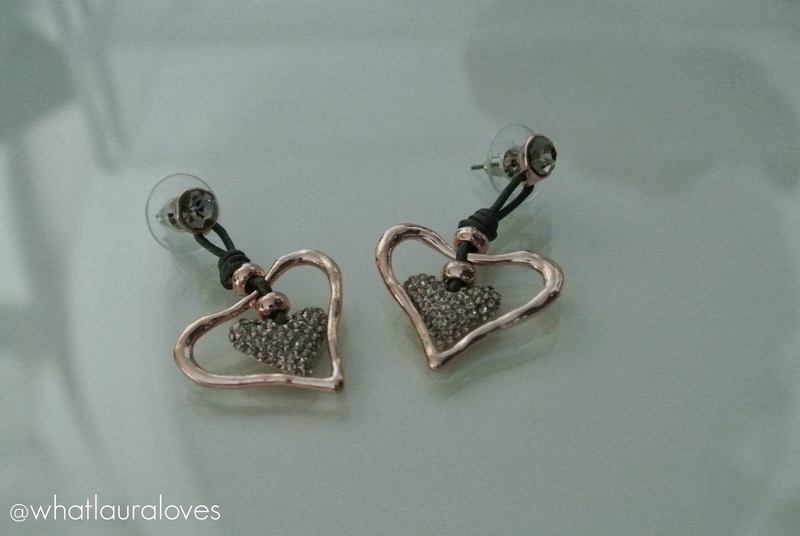 The earrings combine rose gold and diamante hearts with a material that looks like leather to create a really unusual pair of earrings. I think they were around £18. I love them! I am so happy with my purchases, it has felt great to treat myself and I am super excited for the warmer weather to set in. Even just waking up with the sun shining in my room really brightens my day before it properly begins! What are you most looking forward to about Spring? What Spring inspired outfits have you been buying? I love that jacket! I'd like to see a post about your wedding trainers. I'd like to try something similar but I'm not the most creative!